1) Create a Service Provisioner to the ‘state’ API from the poolmanager in the createService and deleteService methods. 2) Update the vm topology to add a reference to the shared service. 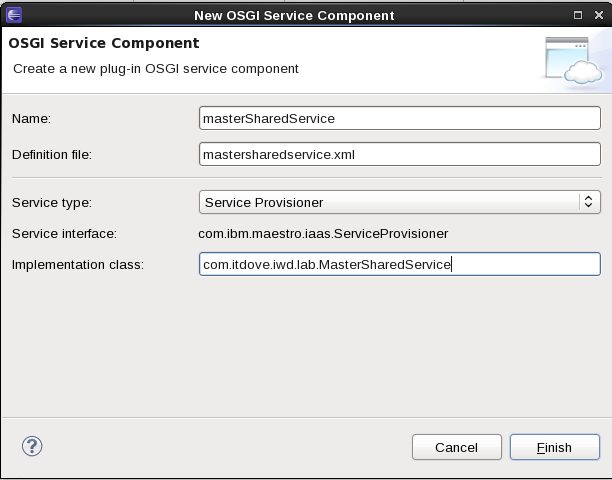 1) Create the Service Provisioner. First, we will use the PDK wizard to create a new OSGi component in the plugin. Right-client on the project, select ‘New’ -> ‘OSGI Service Component’. In the java class, we will need to know the register service and thus we have to bind in the component the registry. For that we will modify the generated OSGI component xml by adding a reference. Now, we have to update the java class by adding the logic to retrieve the IP address of the shared service and call the ‘state’ API. 2) Call the ‘state’ GET method of the RESTFul API to log the current state of the pool manger. 3) Call the ‘pool’ POST method of the RESTFul API to retrieve a resource from the poolmanager. //Call the state API from the poolmanager, the body object is mandatory. //Call the pool API from the poolmanager, the body object is mandatory. 3) Call the ‘pool’ DELETE method of the RESTFul API to release a resource to the poolmanager. You could create a private method to avoid code duplication. 2) Update the vm topology. As in the OSGI component, we are searching the shared service name from the vm topology, we have to add a reference element in the template of our Master component. Now, we can build and test our new version of the master component. For that we will create a pattern that just contains the master component and we check that the poolmanager is running, if not we launch it and this because we mentioned in the master.vm topology that the poolmanager is required. We can start the deployment of our pattern and quickly in the console log of the kernel service we will see the following lines.